The Hoffmann Law Firm is dedicated to getting the maximum compensation for car accident victims in Illinois and Missouri. There have been several recent car accidents which have left a few Missouri residents injured, but thankfully no one was killed. Auto accidents can easily result in fatalities or devastating injuries, and while these accidents had the potential to injure or kill, that was fortunately not the case. In one accident, two Mount Vernon residents were involved in a two vehicle accident on Saturday on Highway 174. The accident occurred in Chesapeake in Lawrence County, reports the Missouri Highway Patrol. Eldon A. Wiehe, 41, was driving a vehicle heading eastbound when he hit the back end of a another eastbound vehicle driven by Charles L. Johnson, 59. 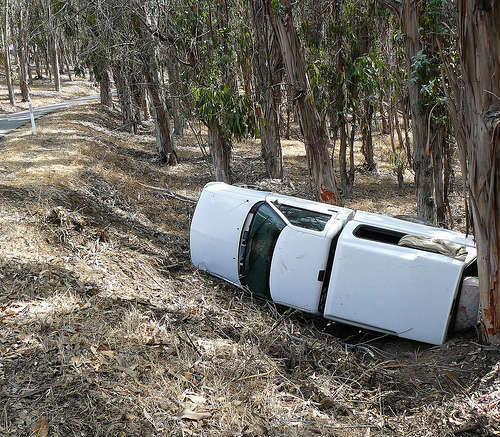 After hitting Johnson’s vehicle, Wiehe skidded off the road and into a tree. Wiehe was taken to Cox Medical Center South in Springfield for medical treatment. His passenger, Heather Brown, 16, received private medical care. And in another accident, a Gladstone man was injured around 6:05 in the evening. The single car accident happened on Highway 59 just one mile north of Diamond in Newton County. Ray A. Basye, 35, drove his car right off the right side of the road. The car then overturned, reported the Missouri State Highway Patrol. Basye sustained only minor injuries in the accident and was transported to Freeman Hospital West in Joplin. Tony E. Triplett, 25, had to be taken to Freeman Hospital West in Joplin as well after an accident on Highway 171 on Saturday. Around 5:30 a.m., Triplett was eastbound in his vehicle on the Highway when he was reportedly hit from behind by another vehicle, which was driven by Adam C. Garner, 26, of Fayetteville, Arkansas. If you or a loved one has been the victim of an auto accident in Missouri, contact a Missouri auto accident attorney as soon as possible. While Missouri laws allow car accident victims a five year period during which to file a personal injury claim. Even though you have this leeway, finding an attorney as soon as possible who can begin the process of investigating the accident, advocating for you and your family, protecting your legal rights, and making sure that you get the compensation you are entitled to is extremely important. The longer you wait the harder it can be to pursue full compensation for the accident, injuries, and other damages. If you or a loved one has been injured in a St. Louis car accident, it is important to act quickly by contacting an attorney who can advise you what steps to take next. If possible, you should also take pictures of the accident scene, get the names and contact information of other involved parties and witnesses, and call the police if necessary. Contacting your insurance company to report the accident should also be a top priority, as should seeking medical attention and documenting your injuries. However, you should otherwise limit who else you talk to about the accident, as this can be potentially harmful to your case. At The Hoffmann Law Firm our car accident lawyers can evaluate your case for free and help you determine what steps to take next. To schedule a free and private consultation, call us today at (314) 361-4242 or fill out our online contact form.